As the population increases, the contradiction between mankind and nature has become increasingly prominent, and the forests have been deforested. People in their daily lives and can not do without wood furniture. So how to reduce the felling of timber, but also to meet people's daily needs for furniture, which is my design needs to be considered. The design uses flat packaging, reduce the waste of resources packaging. To save the resources and protect the environment to the greatest extent. The purpose of this design is to use one chair to meet people's needs at different stages. 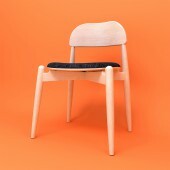 With the advantage of being detachable, children can use chairs with lowered legs. When they grow up or their parents, use the chair after raising the chair legs, in order to reduce the loss of wood. And when parents and children disassemble the chair. Not only can increase parent-child interaction, but also to develop children's intelligence and cultivate their awareness of protecting the environment. The chair as a whole to do removable structure, convenient transportation and production. Flat disassembly, the overall installation of mortise and tenon structure, convenient and quick. Leg disassembly structure: Chair legs, upper and lower ends of the two were placed embedded nuts. Then the middle is fastened by the screw, and the left and right are tightened. Works in February 2017 in Shanghai, 2017 October completed in Shanghai, and in December 2017 in the China Wood Furniture Yearbook display. The overall selection of beech material, combined with cotton linen cushion. 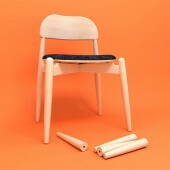 The chair as a whole to do removable structure. Chair back using the mold, bending under the heat forming. Four legs with CNC milling machine forming. Leg disassembly structure of the embedded nut, the first use of drill bits drilled sink hole, and then into the nut. Finally, the surface can be colored open paint treatment, or wood wax oil, maintaining the wood texture. Flat packaging. H: 750mm W:540mm D:480mm seat height: 445 mm. Surface treatment: wood wax oil, open paint. This is a master's degree graduate design research topics, the entry point is from the enterprise's design and management to start. 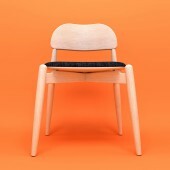 How to create a chair, not only save business costs, but also make consumers satisfied. And in the conservation of resources, to protect the environment under the premise of operation. Seemingly unrelated to the three, in fact, from the design management point of view, behind them are closely linked. How to make the chair as a whole disassembly, what kind of mortise and tenon structure, in order to make the chair more solid, durable. Leg disassembly structure of the deal, what kind of connection method. 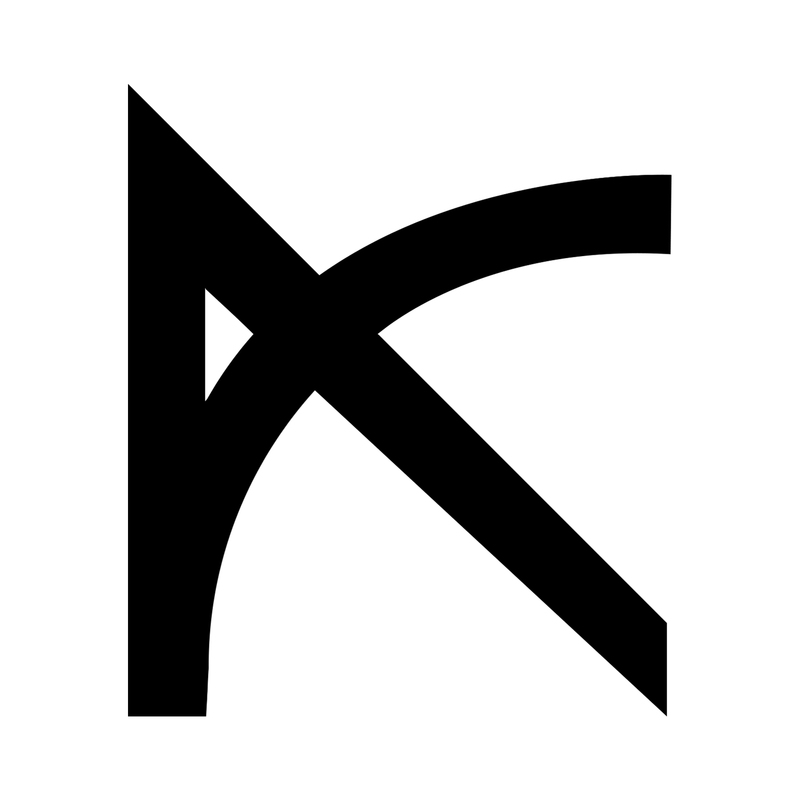 This requires repeated scrutiny and experimentation. Image : Photographer Yahe Zhang, 2017. By the teachers and graduate students of the studio, the main research in product design, the use of design management. System analysis, research design, and design management basic concepts and product innovation management basic principles. From the customer value, market strategy and core competencies, to establish the "design for the competitive advantage," the target design, and from the planning, organization, leadership and control management of basic functions. On the design aspects of the organic composition of the theoretical study and project design. Finally, from the perspective of design process, interface and design knowledge management content and methods of design management to sum up and summarize. 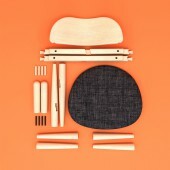 1:2 Chair by Yahe Zhang is a Nominee in Furniture, Decorative Items and Homeware Design Category. · The profile and other works by Yahe Zhang is also kept secret. This information will also be available later. 1:2 Chair by Yahe Zhang is Winner in Furniture, Decorative Items and Homeware Design Category, 2017 - 2018. · Press Members: Login or Register to request an exclusive interview with Yahe Zhang. · Click here to view the profile and other works by Yahe Zhang. Did you like Yahe Zhang's Furniture Design? Did you like 1:2 Chair? Help us create a global awareness for good furniture design worldwide. Show your support for Yahe Zhang, the creator of great furniture design by gifting them a nomination ticket so that we could promote more of their great furniture designs.